Most people don’t have the chance to complete their bucket list before they pop off to whatever awaits us all after death. But some brave few manage to make it the mission of their twilight years, just like 102-year-young Edie Simms from Missouri. With a little help from her pals at the Louisiana Police Department, Edie was able to tick another wild moment off her extensive bucket list: being handcuffed and riding in a Police Cruiser with the blue and twos cheering her on. Simms got her treat as a thank you gift from the Five Star Senior Centre in South St. Louis, where she volunteers with seniors less fortunate than herself. She has been donating handmade gifts to the residents for years. Last year alone, Simms sewed and stitched 413 colourful items, from dresses to scarves to cushion covers, that brighten up the residents’ days. 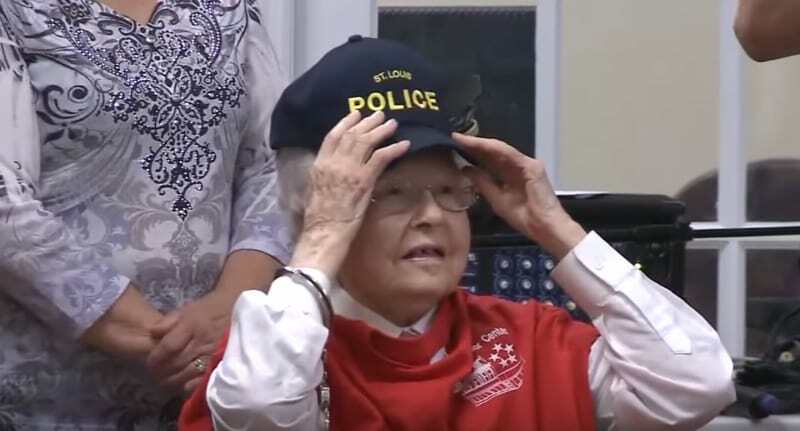 The centenarian also thanked the Louisiana Police – who are ‘happy out with requests like this’, probably because they’ve had some awful press recently – by doling out some words of wisdom. You keep going, don’t ever stop, whatever it is you’re doing. And spend some time doing community service because sometimes the people that you reach out and touch, that is the only person they will talk to in a day. It’s a great world if you just open your eyes and look at it. I’ll be following Edie’s advice for a happy life to the letter in future, especially if it means I get a ride in a police car without the incarceration at the end of the road.